Turn to Greco & Haines for solving your water incursion problems. Whether you have constant, recurring basement flooding or if this is your first, you can count on Greco & Haines to help keep your basement dry. Greco & Haines offers a wide range of sump pumping products and services. We work with you to help you select the most appropriate system for your particular situation. Whether that’s a portable sump pump with a garden hose, replacement of your existing system, or a complete newly installed sump pump, we have the right system to match your needs and budget. Our systems include quality, cast iron sump pumps, pit liner, check valve and discharge piping. We offer battery powered back-up systems to insure that your sump pump will keep running even after your home loses power, and we offer delivery, installation and set-up. Greco and Haines will work with you to select the best water incursion solution for your home. 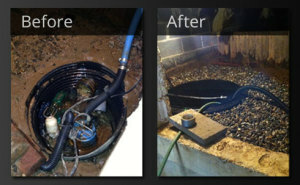 Contact us now for all of your sump pump needs! Next:Is Your Well Water System Prepared for Harsh Winter Weather?